Buy now buttons take you directly to the package that you see here on the website. If you use the "add to cart" buttons, you can pick and choose which items you want to buy. Either way, you can choose to pay via paypal or credit/ debit card. Just follow the instructions in the checkout. *Shipping & and handling for the lower 48 states (US) only. Any international duties or additional charges are the responsibility of the purchaser. Pattern Read 4-3 Pass Coverage provides an overview of how pattern read can be employed to help shut down the most popular pass-oriented offenses in the game today, including the spread and west coast offenses. The DVD details the mechanics of the coverage, as well as its adaptability to multiple formations, motions, and shifts. 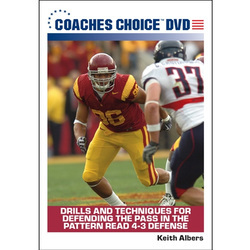 The DVD also explores the pattern-read principles that can be applied to help confound the conventional basic quarterback reads in any offensive system. Stopping the Run With the Pattern Read 4-3 explains how teams can commit significant numbers to stopping the run, without losing the integrity and effectiveness of their pass coverage. 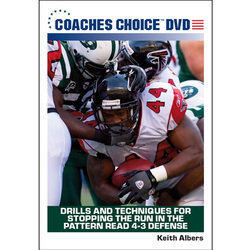 The DVD outlines the rationale for the “pattern read” as a run-support defense, as well as discusses how each coverage provides run support from the secondary. 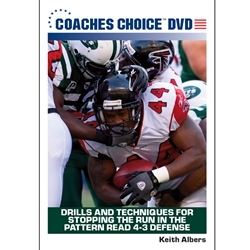 The DVD also details the mechanics of the calls and run-fits involved in this defensive scheme. Drills and Techniques for Stopping the Pass in the Pattern Read 4-3 Defense offers a resource that is designed to help teams that employ this defensive scheme to effectively stop their opponent’s passing attack. 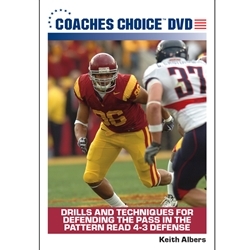 The DVD features a series of proven drills that can be used to develop the fundamental skills that are involved in stopping the pass in the pattern 4-3. Each drill is explained in an easy-to-understand and –implement manner. The DVD is appropriate for coaches and teams at all competitive levels. Drills and Techniques for Stopping the Run in the Pattern Read 4-3 Defense offers a resource that is designed to help teams that employ this defensive scheme to effectively provide run support, without compromising the integrity of their pass defense. The DVD features a series of game-tested drills that can be used to develop the fundamental skills that are involved in stopping the run in the pattern 4-3. Each drill is explained in an easy-to-understand and –apply manner. The DVD is appropriate for coaches and teams at all competitive levels.